The laser unit ships with a hard case with foam inserts to help protect and store your laser — a good addition if wanting to keep it safe while packed in a bug-out bag and on the move. When picking up the laser, the first thing I noticed that this is no run-of-the-mill red laser pointer you can get at any dollar store. The unit is larger than any “pointer” I’ve ever handled before, it feels solid but at the same time it’s light enough to easily carry with you and not notice it. Because this is not a toy and can cause severe and permanent eye damage, there are multiple safety features built in to the unit — some that are required by the FDA (yes, the FDA). 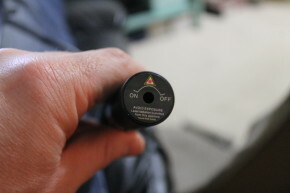 On the front of the laser there is a rotating aperture that allows you to prevent the light from being emitted. There is also a lock that when engaged will prevent the laser from turning on. The unit ships with two keylock keys included. 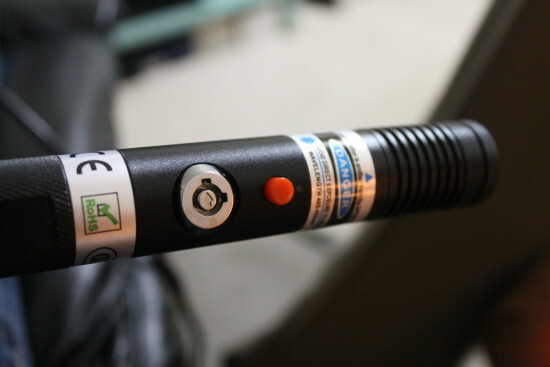 The remote interlock is a pin type lock that must be attached in order for the laser turn on. There are two types of interlock keys are provided, the pin and loop. 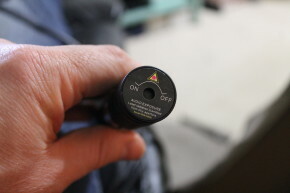 The laser comes with the pin already inserted into the remote interlock. If this is removed, the laser will not turn on. The loop key is used if you require the addition of a third party switch to activate the laser remotely. Simply cut the red wire and attach a remote switch. The two things that stood out for me from these specs are the expected lifetime (5,000 hours!) and the 2 year warranty. 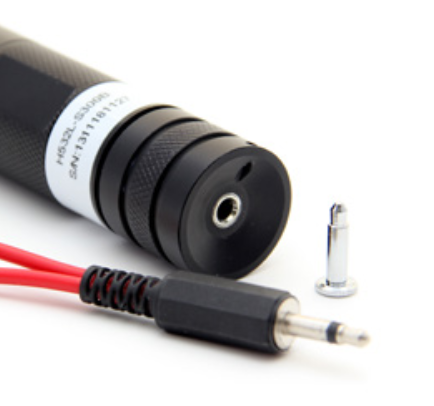 I’ve had lots of smaller laser “pointers” and none of them had a warranty or such a long life expectancy. Those two points are proof to the quality of manufacturing put into these lasers. 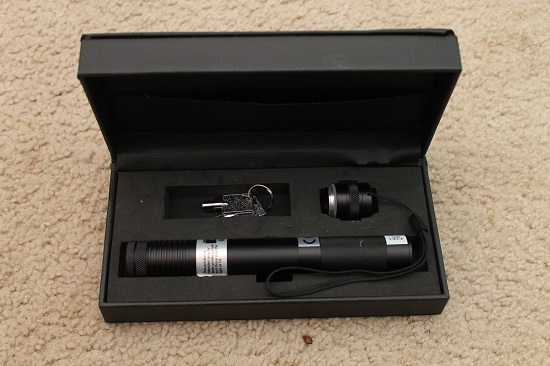 After playing around with this at night and seeing just how powerful this laser is, the first thing that came to mind terms of an immediate survival application is as a nighttime signaling device. Shining this thing in the sky it literally looks like a huge light saber. Now I must warn you, do not shine this up in the sky if you see any airplanes. The laser is so powerful that it could easily blind a pilot and can be seen from miles away. When I was testing this laser, I wanted to see how effective it was through glass (which it is). And because it was dark outside and inside was lit, I did not wear my dark safety glasses. Well, a small amount of the laser light was reflecting back at me off the glass and just that small reflection was enough to temporarily blind my eyes and cause discomfort which I felt for a few minutes. If directed at someone’s eyes, the beam is so powerful that it can easily cause temporary blindness; and if exposed for a longer periods, permanent damage will result. While I certainly understand it’s not the most practical self-defense tool, if you did have enough distance and the time to aim, it could be a great tool to cause temporary blindness while you try to get away. I don’t recommend using this if you are in a threat situation where an attacker is close and coming at you. Your adrenaline will cause you to shake too much to allow you to focus the beam on a small area such as the eye (especially if the guy’s moving). Another application I could see it working well in, is to prevent someone from pursuing you in a car. Especially if you had a passenger that could help you with this, by shining the beam in the pursuing driver’s eyes, there would be no way they’d be able to keep up the chase with this powerful beam hitting their eyes. One great application I could see using this is in nighttime camp security. Let’s say you were in a bug-out situation or had a remote camp and you were a distance away for whatever reason (gathering supplies, night patrols, etc). You could hook up the remote interlock wire to a switch that is triggered when someone trips a line entering your camp. With the laser pointed to the sky you would immediately see and know that someone is in your camp, alerting you to their presence. If you’ve ever used a normal laser pointer to play with your cat or dog, you know how the glowing and moving dot on the floor draws them in like a moth to the flame. They can’t help but to chase it around. Well, this technique doesn’t just work on your pets, it also works on wild animals as well. While it’s more effective on predators such as from the bird, weasel, racoon, canine, and feline variety, it will also attract herbivores (like deer) in some cases too. The application I see is to set up in a stand somewhere in the daytime and point the laser out ahead of you to draw animals in for a closer inspection — just enough to put them into shooting range. The range and brightness of these lasers will easily overcome any washing-out that the sun would do to a normal red laser pointer. This last application I played around with just to see how effective it would be in making fire. While it is not the most effective (in terms of the laser directly causing fire) it can be used to start a fire indirectly by igniting a primer like char cloth, birch fungus, or even a cigarette. In the video below you can see me attempting to start a fire with it directly on the tinder bundle (it smokes, but no flame) versus lighting the char cloth and then blowing that in a tinder bundle into a flame. In addition, it easily ignites matches if you were in a situation where you’d forgotten your matchbox/striker and had your laser. 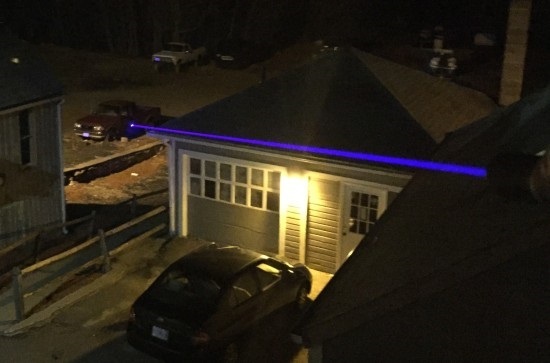 Besides how impressive these lasers are in their normal applications (you really need to experience them at night to fully understand how powerful these are) they are actually fairly useful in a variety of survival situations. While I wouldn’t trade this for some of my other gear, if you’re the prepper that “has everything” and you’re interested in adding this to your collection of “cool” survival gadgets, be sure to check them out over at SkyTech Lasers, you won’t be disappointed. I purchased a similarly shaped but lower power and quality green laser on ebay. Lower power green is safer and still quite visible. Instead of a flashlight still focus adjustment I Opted for one that came with multiple lens that produced wide scattered points of light. My testing at dusk / night showed this could produce a bright pattern on ground or treetops from 6 inches wide to 300 feet wide depending on distance to target you chose. On a 30 foot hill above a park I could illuminate most of the park with bright green dots. It was very visible. Seperatly I purchased a lens that projects the letterd SOS but wasn’t as noticeable as the wider pattern. Take spreading lens off for more descrete single point signaling. I keep in my signaling module along with headlamp, flare, etc. Power a laser diode thru an electronic driver circuit to try and light a fire, create a perimeter security silent alarm, or use as an Aerial signal is just dumb. Wow, some people are just born dicks I guess. The man is just trying to give you some ideas on what to use a laser for, if you happen to come across one that is. Why does everyone have to be so disrespectful. Of course there are more efficient ways to get these things done, but guess what, you may just happen to stumble across a laser some where, say during the end of the world, who knows. You never know what kind of situation you are going to get yourself in at any point in time.